Talented Kids Doing Great Things: UTE Conference | ¡VidaMaz! In June it will be six years since we started this blog, and this past week we were afforded an excellent opportunity to reflect on our experience with it. You see, Greg and I were invited to present at a tourism conference at the Universidad Tecnológica de Escuinapa. It was a wonderful experience—the students were amazing, we met some incredible people, and I also really enjoyed how it motivated me to reflect on where we’ve been and what we’ve learned. Speaker gift—almost too pretty to eat! We started VidaMaz.com in order to stay in touch with family and friends after our move. We wanted to be able to share a bit of our new lives with them. 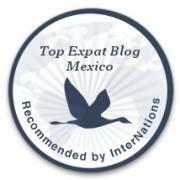 What we quickly learned, however, was that the most avid readers of our blog were people who loved Mazatlán, who fantasized about living here, or who already enjoyed living here. We started without any sort of a plan; we were just going to publish posts about our experiences, our daily lives. We love watching the sunset from our balcony each evening. We found ourselves taking a photo (or ten) of those sunsets, because we were eager to share our joy and wonder. Every day it was so gorgeous, and so very different from the night before! We’d count our lucky stars that we could walk down the beach, find some divers, and eat a dozen freshly caught oysters and a fresh coconut for less than US$5. The blog helped us to share that joy. We are avid bicyclists, and loved recording our Sunday morning rides, or the monthly CicloNoche events. We’d bike by a place and notice that inside they were making giant Carnavál statues, so we’d introduce ourselves and learn how it all worked. We love discovering new places. We became fascinated with the terrific things Mazatlecos were doing in their corners of the city, from the handicapped accessible playground to the swim club in Playa Norte. And we were happy to share what we’d seen. We’d write about our morning walks along the malecón, our hikes up the lighthouse, or our Sunday ride up to Cerritos—recording the fishermen putting their boats in or out of the ocean, the musicians playing their music, or the families picnicking on the beach. Just another Sunday in paradise. We fell in love with the fact that here people reuse and recycle, much more than we were used to up north of the border. It made us so happy! We took loads of photos of uses for empty soda bottles, recorded stories of the guy who soldered the handle back on our favorite frying pan while we waited, or the wonders worked by the local cobblers. We love the cultural activities that take place here, and have enjoyed making some videos about Día de los Muertos, Carnavál, MotoWeek, and Día de la Música. I like crafts, like to “putz” as we called it when I was growing up, and making these short videos was a creative outlet. It was fun. And of course, we love day trips, weekend jaunts, and even holidays around other parts of Mexico, many of which were recorded on the blog. Then came the swine flu. It had such a huge impact on our daily lives. Movie theaters closed. Concerts were cancelled. Everyone wore masks over their mouths, and used antibacterial gel everywhere. In researching it, the flu seemed to originate on a pig farm in Wisconsin, of all places. But the way Mexico reacted to it caused all sorts of fallout, huge decreases in tourism, and a horrible economic ding on our adopted home. Next the narco violence rose to the forefront of international media reporting. Wherever I travelled for work, from Istanbul to Bogotá, people looked at me horrified when I told them where I lived. “Why in the world would you choose to live somewhere so unsafe?” So our little blog took on a new passion for us. It was our small way to let people know that we were living peaceful, enjoyable, healthy lives, despite what the media might portray. That Mazatlán was beautiful, was populated by a whole lot of cool and caring people, and that life here was sweet. It was our way to combat the anger we felt that international media insisted on selling only one very negative story of my beloved and wonder-filled adopted country. A few of the hotels started using our posts, as did some of the realtors and condo associations. They seemed to take our stories about “normal life” as proof to the outside world that living here was, indeed, great. That was fine with us; we just asked for credit. Then we were asked to be interviewed for a few videos, about how it was to live here in Mazatlán as a family, to raise a son here. It wasn’t too long before we were honored to receive an award from the Hotel Association and the State Secretary of Tourism, commending us for our work in tourism. We sure had never planned to be a tourist blog, but such, it seemed, was how we were perceived. So, six years later, when Dr. Arturo Santamaría Gómez asked us to present at a university conference on using blogs in tourism, we were eager to share our experience and learning. I didn’t realize it would cause me to reflect back, but indeed it did. What had we learned? Where had we journeyed? What stood out most for me was how many incredible people we have had the true pleasure of meeting over the past six years. Even without the blog, we would have met many of them—we are curious, outgoing, we love to learn. But, because of the blog, we’ve met so many more, and have interviewed people in more depth, than we would have normally. This was the true gift of starting a blog—the community it created. The people who are now friends who began as readers, who perhaps wrote us with a question, and now teach us. 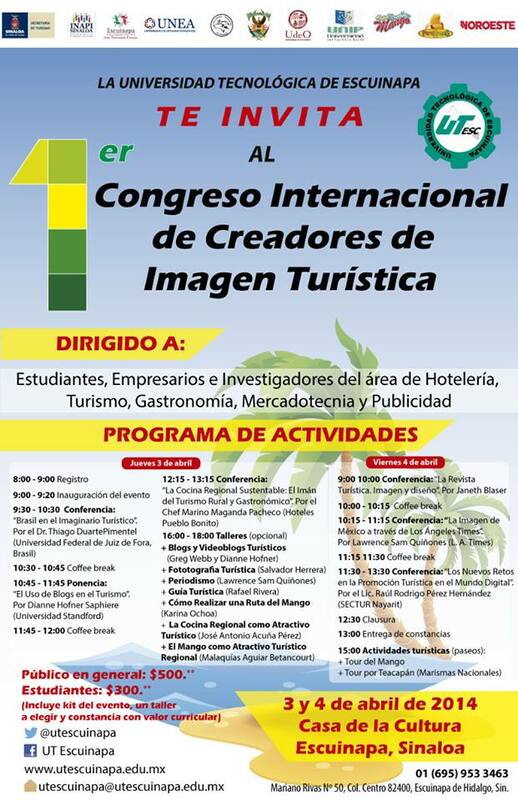 So, that very long introduction is to tell you that this past Thursday and Friday we had the distinct honor of presenting at the Congreso Internacional de Creadores de Imagen Turistica, alongside a very interesting Brazilian engineer (Dr. Thiago Duarte Pimental), a Los Angeles Times columnist I’ve long admired (Sam Quiñones), the very talented head chef of Pueblo Bonito (Marino Maganda Pacheco), a charming gentleman from the Nayarit Secretary of Tourism (Raúl Rodrigo Pérez Hernández), and a very talented woman who has changed the face of our fair city in several major ways (Janet Blaser). Students attended the conference from several universities in Mazatlán, from throughout southern Sinaloa and northern Nayarit. And were they enthusiastic! I told them their clapping and hollering made me feel like I was an Olympic star! In addition to the main talk, Greg and I gave a 2 1/2 hour workshop on blogs and videos. We were blown away by the students’ commitment to encouraging tourism in a sustainable way—environmentally, socially, and in a way that builds an equitable, respectful relationship between the visitor and host. It was such a joy to be able to work with them! In addition to the students, we of course met some awesome faculty, tour providers, city tourism professionals, and regional business people. We honestly do live in a place where people rock! We met one young lady who wrote her master’s thesis on a mango tour in Escuinapa. Rather than keep it to herself and make money off it, she has given it to the people, where it belongs, and they are launching it as a public project. Stay tuned and don’t miss out on this cool glimpse into a local farming tradition! We are truly blessed to have found such a beautiful home and community here. We are very grateful to have been welcomed to a place within it. It is not often we get to teach young people, so this experience was truly splendid. Please, take a moment to let us know the kind of stories that you most enjoy here on VidaMaz.com. We’d love to hear from you.